To return to [the question of a] method of writing, it illustrates another truth, and that is the tortuous path we follow in our teaching. … We … teach … geometry in order to teach a child to write; … making the child’s mind exert itself to follow geometrical abstractions only to come down to the simple effort of drawing a printed D. After all, must the child not have to make another effort in order to forget the print, and learn the script? And even we in these days [we] still believe that in order to learn to write the child must first make vertical strokes. This conviction is very general. Yet it does not seem natural that to write the letters of the alphabet, which are all rounded, it should be necessary to begin with straight lines and acute angles. In all good faith, we wonder that it should be difficult to do away with the angularity and stiffness with which the beginner traces the beautiful curve of the 0. Yet, through what effort on our part, and on his, was he forced to fill pages and pages with rigid lines and acute angles! To whom is due this time-honoured idea that the first sign to be traced must be a straight line? And why do we so avoid preparing for curves as well as angles ? Let us, for a moment, divest ourselves of such preconceptions and proceed in a more simple way. We may be able to relieve future generations of all effort in the matter of learning to write. But let us observe the spontaneous drawings of … children. When, for example, picking up a fallen twig, they trace figures in the sandy garden path, we never see short straight lines, but long and variously interlaced curves. … That vertical strokes should prepare for alphabetical writing, seems incredibly illogical. The alphabet is made up of curves, therefore we must prepare for it by learning to make straight lines. “But,” says someone, “in many letters of the alphabet, the straight line does exist.” True, but there is no reason why as a beginning of writing, we should select one of the details of a complete form. We may analyse the alphabetical signs in this way, discovering straight lines and curves, as by analysing discourse, we find grammatical rules. But we all speak independently of such rules, why then should we not write independently of such analysis, and without the separate execution of the parts constituting the letter? It would be sad indeed if we could speak only after we had studied grammar! It would be much the same as demanding that before we looked at the stars in the firmament, we must study infinitesimal calculus; it is much the same thing to feel that before teaching … to write, we must make him understand the abstract derivation of lines and the problems of geometry! “Let us observe an individual who is writing, and let us seek to analyse the acts he performs in writing,” that is. the mechanical operations which enter into the execution of writing. This would be undertaking the philosophical study of writing, and it goes without saying that we should examine the individual who writes, not the writing; the subject, not the object. Many have begun with the object, examining the writing, and in this way many methods have been constructed. I had a beautiful alphabet manufactured, the letters being in flowing script, the low letters 8 centimetres high, and the taller ones in proportion. These letters were in wood, 1/2 centimetre in thickness, and were painted, the consonants in blue enamel, the vowels in red. The interesting part of my experiment was, that after I had shown the children how to place the movable wooden letters upon those painted in groups upon the cards, I had them touch them repeatedly in the fashion of flowing writing. I multiplied these exercises in various ways, and the children thus learned to make the movements necessary to reproduce the form of the graphic signs without writing. I was struck by an idea which had never before entered my mind — that in writing we make two diverse forms of movement, for, besides the movement by which the form is reproduced, there is also that of manipulating the instrument of writing. And, indeed, when the … children had become expert in touching all the letters according to form, they did not yet know how to hold a pencil. To hold and to manipulate a little stick securely, corresponds to the acquisition of a special muscular mechanism which is independent of the writing movement; it must in fact go along with the motions necessary to produce all of the various letter forms. It is, then, a distinct mechanism, which must exist together with the motor memory of the single graphic signs. When I provoked in the [students] the movements characteristic of writing by having them touch the letters with their fingers, I exercised mechanically the psycho-motor paths, and fixed the muscular memory of each letter. There remained the preparation of the muscular mechanism necessary in holding and managing the instrument of writing, and this I provoked by adding two periods to the one already described. In the second period, the child touched the letter, not only with the index finger of his right hand, but with two, the index and the middle finger. In the third period, he touched the letters with a little wooden stick, held as a pen in writing. In substance I was making him repeat the same movements, now with, and now without, holding the instrument. Montessori, Maria. 1912 (1964). 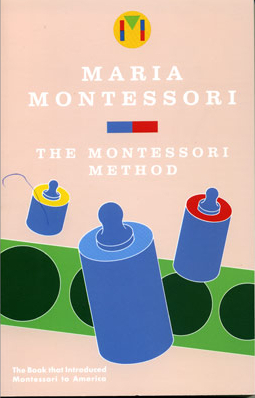 The Montessori Method. New York: Schocken Books, pp.256-263.